And like that, the season is over. 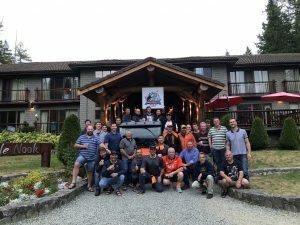 This was a record breaking year, which ended with the hosting of an amazing group of 60 from Australian and New Zealand. Thank you to everyone who made this such an amazing season – from guests to our staff. We have some terrific memories from this season. From an engagement on our back patio, 60th birthday celebrations, families enjoying some quality time and father/son derby’s. 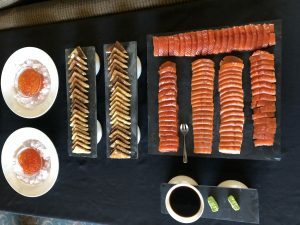 The chefs continued to wow guests with all their delicious creations, showcasing some of BC’s finest produce and fresh catches, straight from the dock. 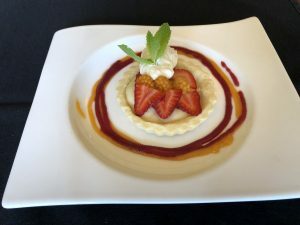 These are only a few of the amazing meals that our guests got treated to this season. 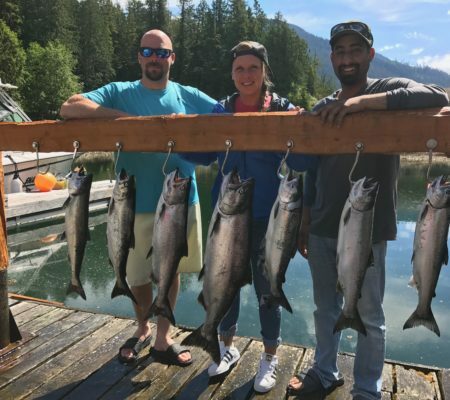 The chefs weren’t the only ones who were busy this season, the fishing guides and guest services staff, stayed busy processing all the fish that was caught this summer. 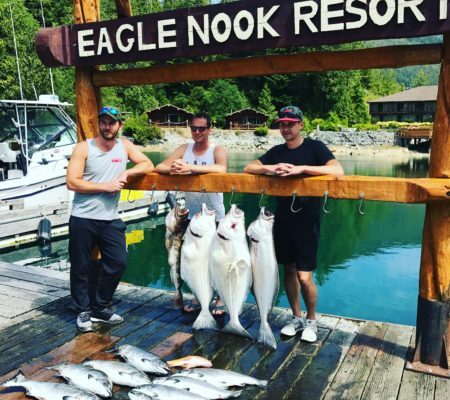 We had plenty of chinook, coho, halibut, rock fish and lingcod that hit the dock, with our guests leaving with huge smiles on their face and fish to cook up and reminisce about their amazing time at Eagle Nook. It felt good to have so many Chinook salmon in the mid to high twenties all throughout the summer. Our Australian/New Zealand Group brought in our first Tyee of the season, coming in at a whooping 36 pounds. A huge congratulations to Tyee Rick and Mark for reeling in that beauty. The Chinook Salmon fishing this year was above par on numbers and coho fishing was off the charts. Halibut fishing didn’t disappoint either, even though we had to let some monsters go, we reeled up beauties, some up to 50 pounds. 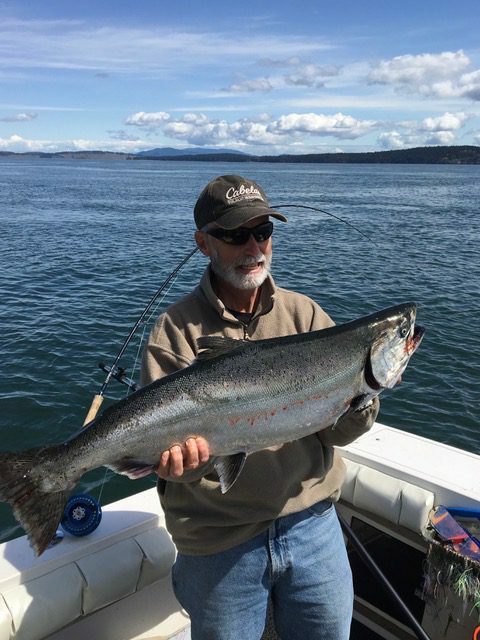 Coho fishing went off the charts in July and August. Letting go of 20 plus coho was just the norm, in hopes to find that nice chinook, which was lots of fun for our guests. 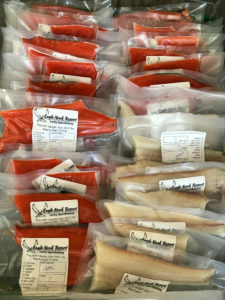 Success was also had while waiting on anchor for the halibut to bite, plenty of hatchery coho getting jigged up. All in all the fishing was great, the guests got that true West Coast experience and the guides had fun! 2019 is already starting to book up and what is looking like it will be another amazing season! So don’t miss the chance to come and experience everything that Eagle Nook has to offer. We promise it will be a decision you won’t soon forget. Friends will be jealous about what an amazing time you had, they’ll want to come too. Many of our guests can attest, that you’ll have so much fun, you’ll make it an annual tradition. 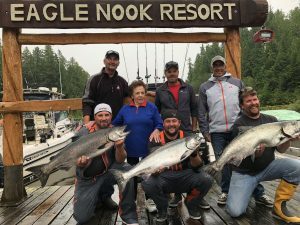 Hot summer days and long summer sunsets are now a thing of the past on Vancouver Island, but while the fishing season may have come to a close last month things have by no means quieted down for the crew at Eagle Nook Resort & Lucky Sportfishing. After getting settled back into our Victoria office in mid-September, it was right back out to Barkley Sound to finish up “winterizing” the resort and make sure our winter caretakers were well prepared for the cooler, wetter seasons ahead. Since then our general manager, Dan, has been back up a couple times to work on winter maintenance tasks since it’s never too early to start prepping for next summer! One of the last catches of 2017, a 28 pound Chinook landed right inside the Sound! A couple of our guides have been out fishing around Victoria and Sidney since returning home as well. 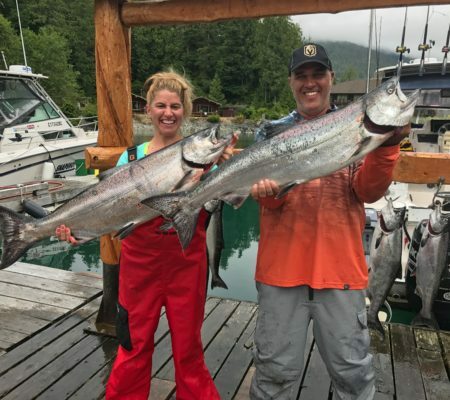 While it doesn’t compare to summertime salmon fishing in Barkley Sound, they’ve gotten into a couple nice Chinook each time they’ve been out. 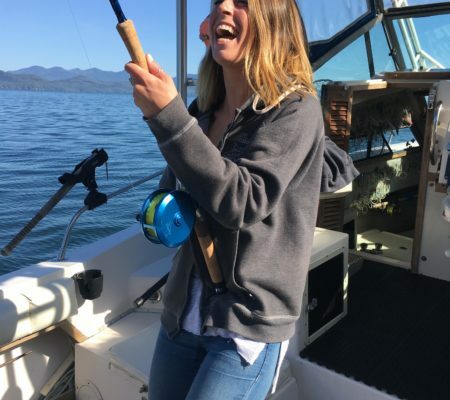 They’ll be heading inland this weekend to try their hands at sturgeon fishing in Harrison B.C., and we’re excited to see the results of that trip next week. After sturgeon fishing they’ll be heading on a road trip to meet guests in Alberta and set up fishing trips for next year. It’s a tough job but somebody’s gotta do it! We’re already booking trips well into 2018 – July and August are booking up quickly, and some dates are already sold out. 2017 was one of our busiest seasons to date, and we’re expecting 2018 to surpass that, so if you’re thinking about a salmon and halibut fishing trip for next year give us a call; we’d be happy to talk about the options and put together a customized package for you! We’re available 7 days a week at (250) 880 0636 or info@eaglenook.com. It feels like mere days ago we were hosting our first pre-season salmon derby in June, but just like that our 2017 season has come to a close. It was a whirlwind 3 and a half months, with great fishing and better company and it’s bittersweet to see the end of it. August fishing was consistently good, with nice sized Chinook and Halibut coming back to the dock everyday. Lots of happy guests were sent home with fish boxes so full we could barely seal them shut. Towards the end of the month Coho started to move into the Sound and on days Chinook fishing was slower, Coho more than made up for it. The weather also held out for us, and aside from a few typical “fogust” days at the beginning of the month the sun always managed to burn through and combined with mostly flat calm seas it for some unreal days on the water. 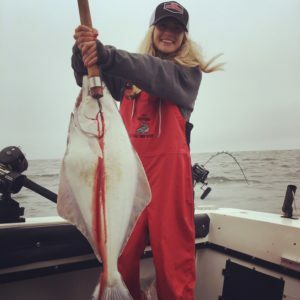 Our guides also got into some unreal Halibut at the end of the summer, right before the sport fishing closure that came into effect in early September. 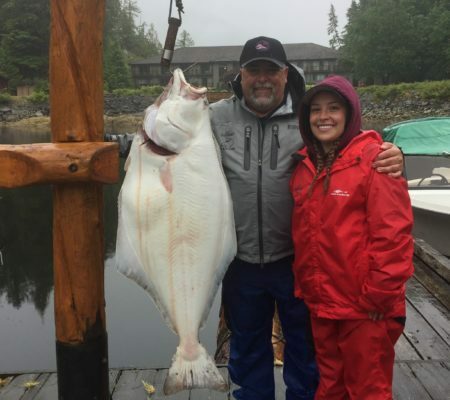 The biggest Halibut we saw back at the dock was caught September 4th by one of our resort shareholders, Sam, and measured in right at 133cm. A couple of our guides were out “fun fishing” at the end of the season as well and caught a couple nice ones that our staff were happy to split up and take home – one of the perks of the job! We were busy with fishing guests right up until our last day on September 11th, and then after a few full days of winterizing the resort we all headed our separate ways home to winter jobs, travel plans, or just catching up with family and friends. The end of the season is always bittersweet, and after a couple days off we’re looking forward to what 2018 will hold – we’re already taking bookings for next year so give us a call or shoot us an email if a trip to the west coast is on your radar for next summer! 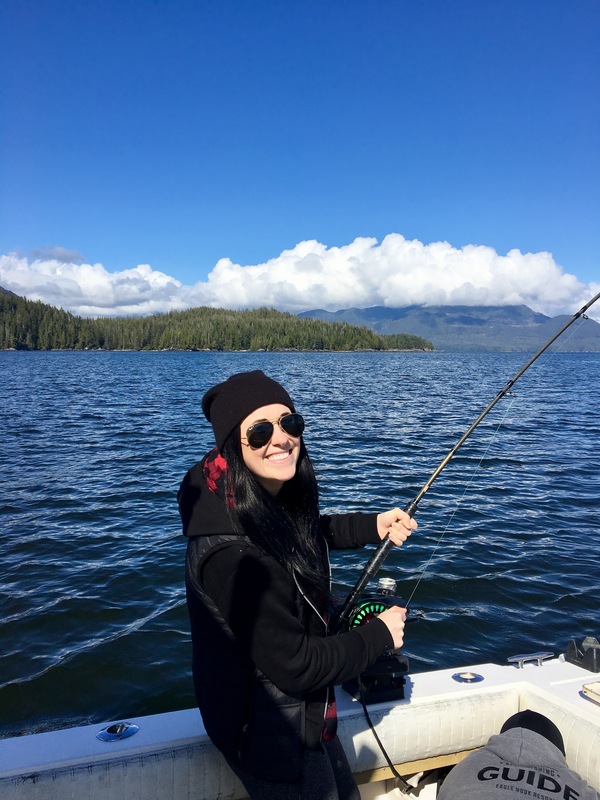 Alyssa, one of our guest services staff, with her first Halibut! It’s hard to believe August is already upon us – our season has been flying by! 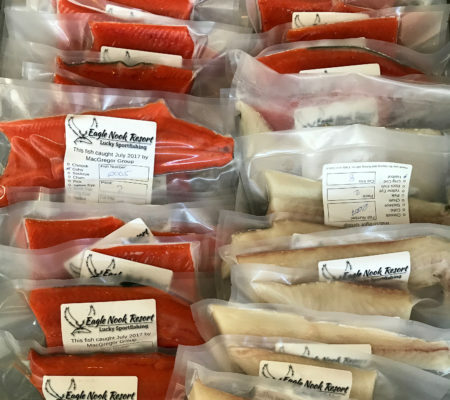 Over the course of the past few weeks we’ve been able to send our guests home with jam-packed boxes of a variety of fish; halibut, salmon, lingcod and rock fish have been plentiful across the board. 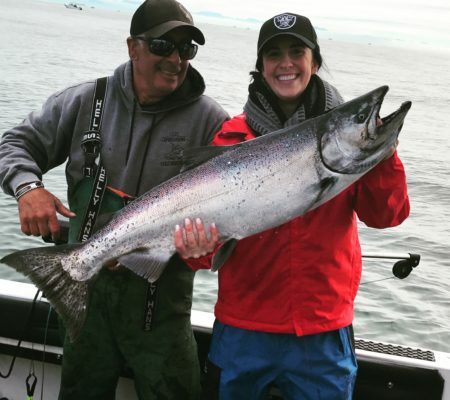 Offshore fishing has picked up substantially, consistently producing our guests Chinook salmon limits each trip. The west coast of Vancouver island including the Ucluelet, Bamfield area will see lots of Coho and they are starting to show. Keepers will top up your daily salmon limits. Bottom fishing has been resulting in some nice above-average halibut in the 50-60 lb range plus lots of great 30 lb fish. Our guides have also found some new lingcod spots that are producing daily limits of these prized (and tasty!) fish. We’re back on the water every day so check out our Facebook and Instagram posts for daily updates! The weather has also been beautiful here at Eagle Nook Resort. The calm mornings are getting us out and back from the fishing grounds in record time. Once back at the dock our team fillets, portions, and packages the daily catch while guests enjoy Chef Jimmy’s variety of hot dock lunches (the mac and cheese is a definite crowd pleaser). Once we are back at the dock there’s time to jump in a kayak or on paddle board and enjoy the amazing weather. 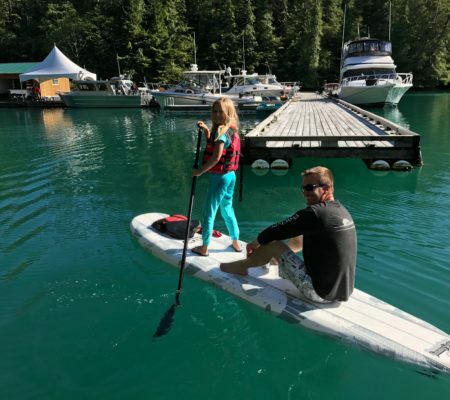 No one is too young or too old to take advantage of a sunny cruise around Jane Bay. 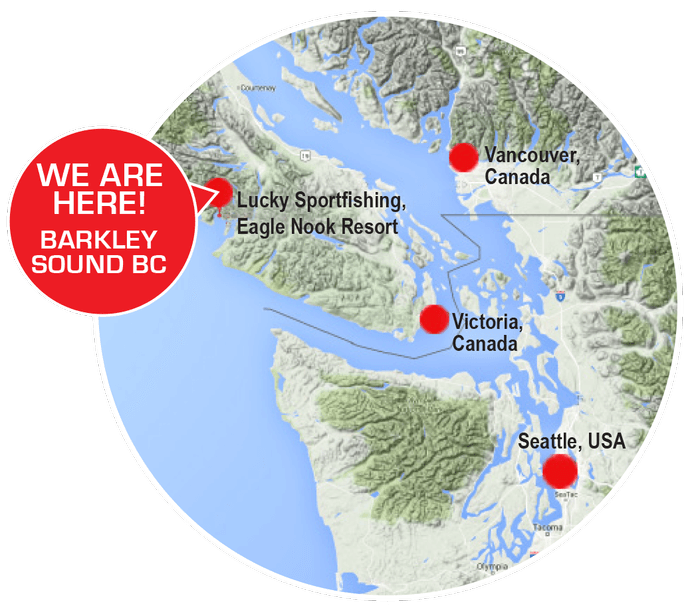 If you’ve ever thought about a fishing charter in Barkley Sound, feel free to give us a call at 1 (604) 357 3361. 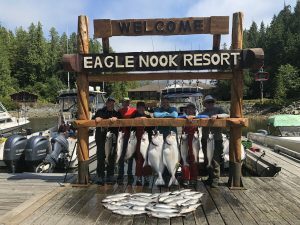 We’re more than happy to chat with you about the sport, what Eagle Nook Resort offers, and potential fishing and adventure opportunities with us. The salmon are in Barkley Sound! No running offshore yet, we are getting limits of Salmon right here of Cree Island, Austin Island and Harbour Entrance. The other hot spot has been Keeha Bay. Our usual Halibut spots have been producing nicely with some upper limit hat’s every day. The fishing is hot, the sun is out and we are ready to go. From The Lucky Sportfishing Team! It’s been an incredibly busy first few weeks up in Barkley Sound but things are officially underway and it feels great to be back. Both of our pre-season derbies were successful once again, fishing was good and the company was even better. 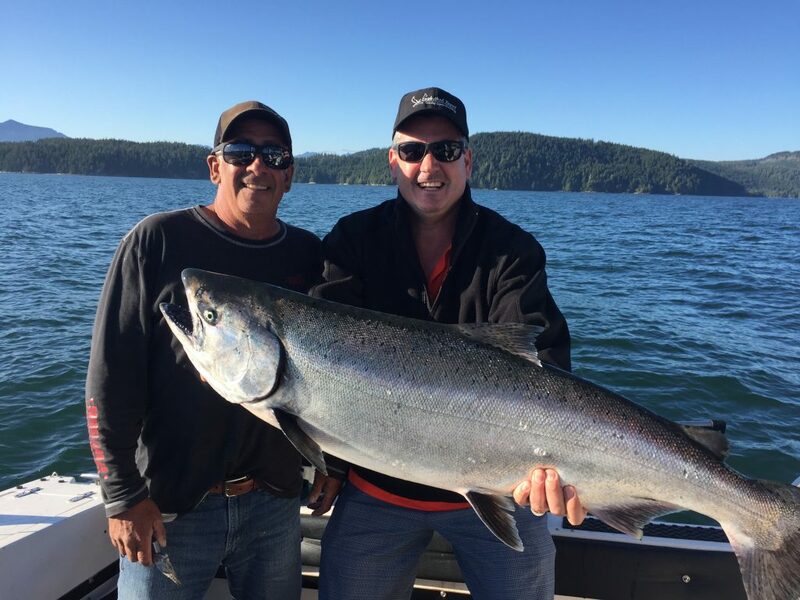 Eric Scott of Scotty Products caught the first derby winning Chinook fishing with our guide Jeff. 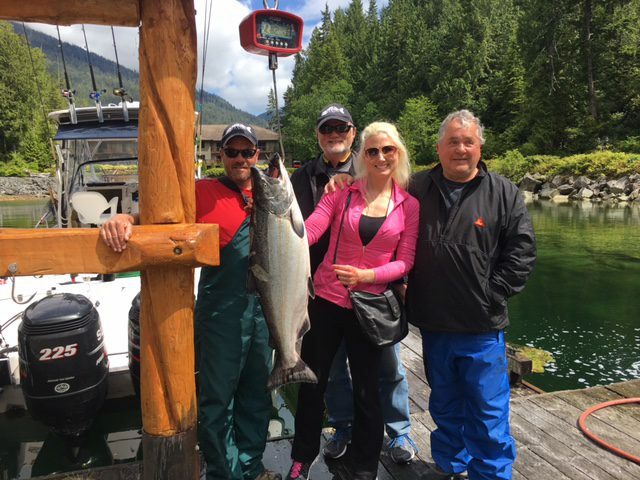 The second derby was claimed by Julia Raeder, fishing with our guide Rick; they landed a beautiful 27 pound Chinook to take home the top prize. Rick, Kurt, Julia & Floyd with her derby winning Chinook. It was awesome to see new and returning faces out for both weekends, and we’ve already started reserving spaces for 2018! Our new staff team are all here now and fully settled in, and we can’t wait to see how the summer unfolds. 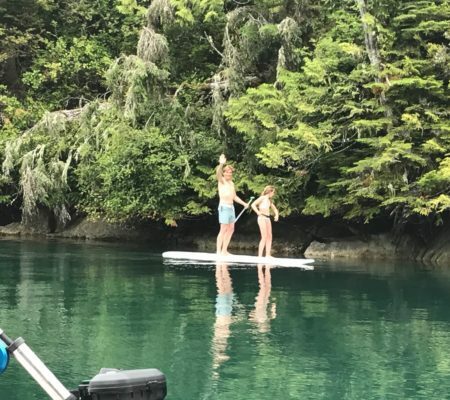 Their first week up here was a busy one between trail maintenance, dining room training and dock hand procedures, but we still managed to sneak in a wine tasting and even a quick floatplane ride – a few of the perks of working in Barkley Sound for the summer! 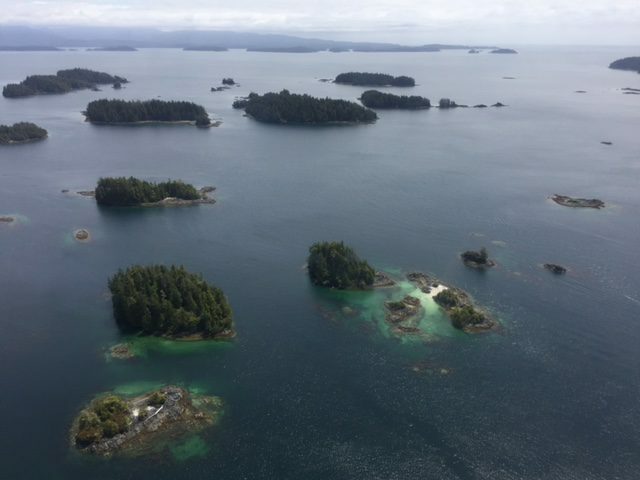 An aerial view of Barkley Sound from our quick floatplane ride. Our first regular season trip took place over the Father’s Day weekend and it was a great opportunity for everyone to be put through their paces and prepare for the rest of the season. 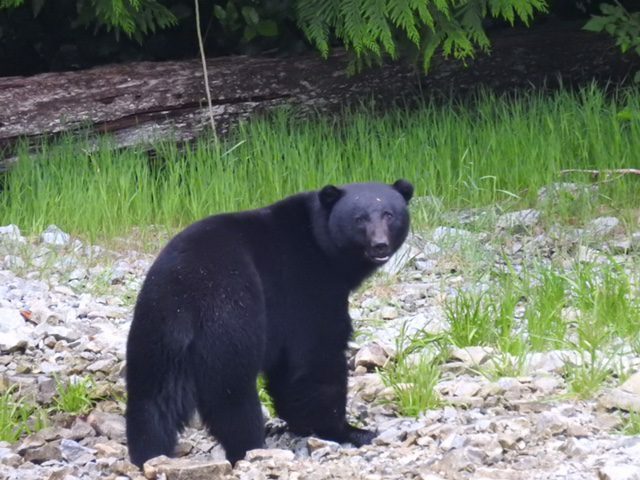 Although the weather wasn’t great over the weekend the fishing made up for it, and we even got a few wildlife sightings in – bears, whales, bald eagles and a brief sighting of a wolf to top it off! This guy was scavenging for snacks on our beach last week. Our summer continues to get busier as it progresses, but we still have a couple spaces in late August and early September if you’re thinking about a fishing trip. We’re booking new trips almost everyday so get in touch with us soon! We’re officially back up and running in Barkley Sound, prepping for both pre-season derbies and our regular season opening on June 15th (we’ve only got a couple spaces left for our Father’s Day Weekend Special so book soon!). It’s been a busy week of pulling everything out of storage, setting up rooms and just generally de-winterizing, but a lot has been accomplished and we’re just putting the final touches on now. One of the tasks to be finished up before next weekend is updating our gutting table – yesterday we made some serious progress and aside from needing to add flashing along the top and touch up the varnish it looks great. Our newest team members, Kevin doing maintenance, and Sue doing housekeeping, are fully settled in now and impressing everyone with how hard they’re working at getting the resort ready to go. The weather has also been unreal over the last week and after what seemed like a never ending winter, summertime finally feels like it’s right around the corner. Last night we got out for a quick night bite before the sun set and got into a few nice little Chinook salmon. We let most of them go so they have the chance to get a little bigger but it’s good to see there are lots of fish in the Sound (and tons of bait too). We also got a show from a small humpback whale feeding close to shore; seeing whales in the area already is a great sign for our upcoming adventure tours! 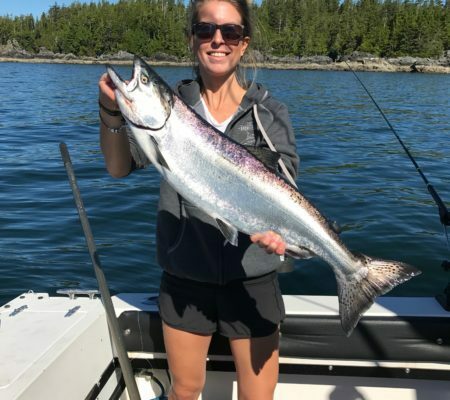 Our first pre-season guests will be here this Thursday and we’re excited to see how big the derby winning fish turns out to be – last year it was a 25 pound Chinook that brought home the top prize. We’ll be posting updates all weekend so stay tuned! Today marks 1 month until Eagle Nook Resort’s regular season opening on June 15th, and to mark the occasion we’re running a Father’s Day Special June 15th – 18th. 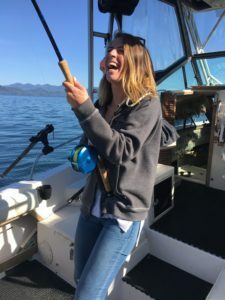 Early season fishing has been great around Victoria as well as up in Barkley Sound, and an unbeatable deal is the perfect excuse to plan a fishing trip with family (or friends) in mid-June. 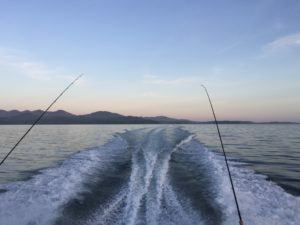 This past weekend presented yet another opportunity for a trip out to the west coast to continue preparing for the season, run boats and supplies out to the resort and get out fishing in Barkley Sound. While the first half of the weekend was spent building a new and improved fish cleaning station out at the resort, the guys managed to get out for a fish Sunday morning before heading back into town. 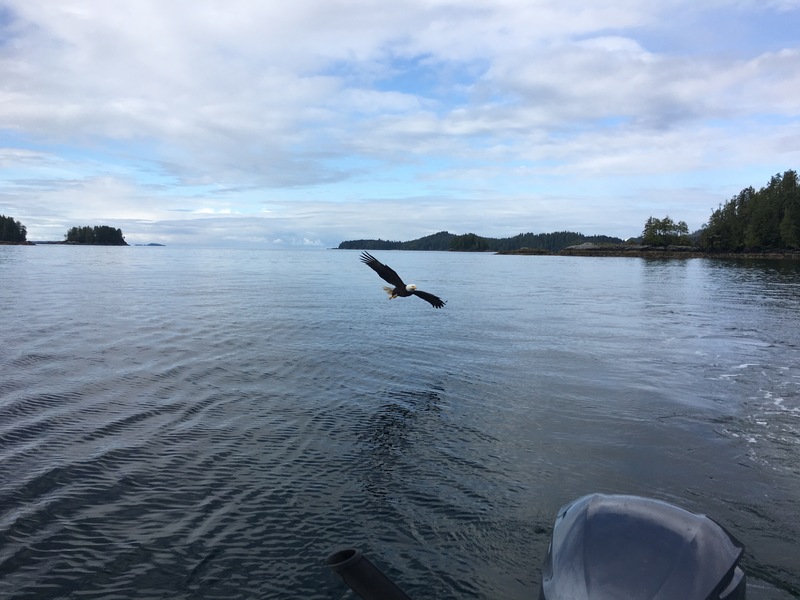 They put 3 Chinook salmon in the box but the best photo op came when Jeff caught a lingcod and was photo bombed by one of Barkley Sound’s many resident bald eagles coming in for a closer look. This early in the year it’s not hard to tempt a bald eagle (or two) down from the trees for a rockfish snack and sometimes they’ll even try to steal a fish right off the end of a line. By the time August rolls around though, they’re pretty well fed and it’s a little more difficult to convince them to leave their perches. The first wave of our staff are moving out to the resort this upcoming Sunday and we’ll have a small crew out for our pre-season derbies, happening the first two weekends in June. The rest of the team will come up June 11th in preparation for our first regular season trip, it sounds like everyone’s getting ready to make the big move, and counting down the days until our opening weekend, June 15th – 18th. If you’d like to celebrate your dad (or grandpa, or uncle, or anyone who deserves a getaway) and join us for the first weekend of our 2017 season let us know soon, before our Father’s Day Special runs out! The beginning of May means that there’s less than 3 weeks until we move up to the resort for the summer, and just over a month until we open our doors for the 2017 season. This year our opening weekend happens to coincide with Father’s Day on June 18th and in the spirit of celebrating Dads everywhere we’re offering a Father’s Day Special June 15th through 18th. Bring your dad (or uncle, or grandpa, or anyone else who loves fishing and deserves a getaway) and enjoy 3 nights all-inclusive accommodation, gourmet meals and private fully guided fishing charters for unreal rates on our opening weekend. 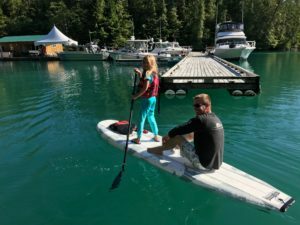 Father’s Day Special packages start at $2695 Canadian per person for 2 guests, or $2195 Canadian per person for 3 guests. 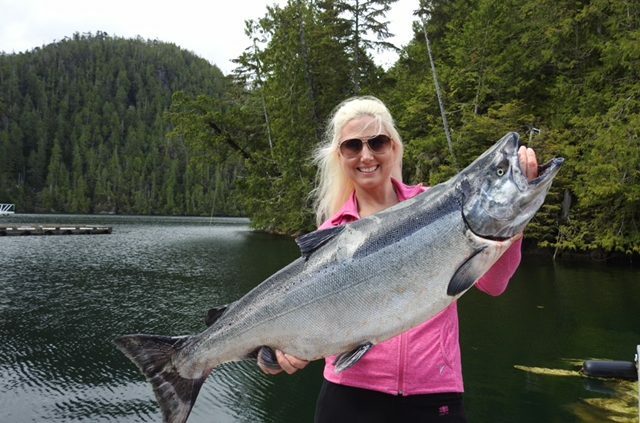 In fishing news, although spring has gotten off to a slow start on Vancouver Island, the fishing certainly hasn’t. 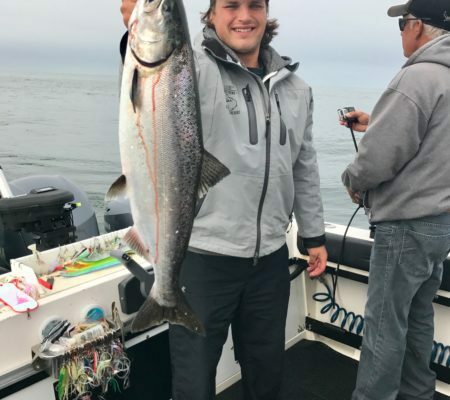 Early season salmon fishing has continued to be great around Southern Vancouver Island over the last couple weeks, and in between prepping for the season (we’re officially less than a month away from our first derby!) we’ve still managed to get out on the water and put a couple nice Chinook salmon in the boat. 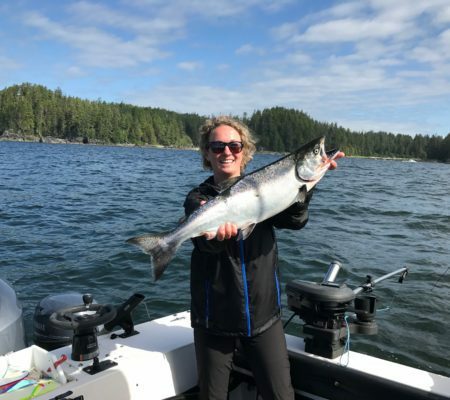 Ed (pictured below) did a charter out of Sidney last Friday with our guide Jeff and landed a 22 lb Chinook – hopefully foreshadowing of his trip out to Barkley Sound this summer. The weather has started to warm up around Vancouver Island so Jeff was back out for a quick fish Tuesday morning, caught an unreal sunrise and another couple of nice Chinook to start the day. 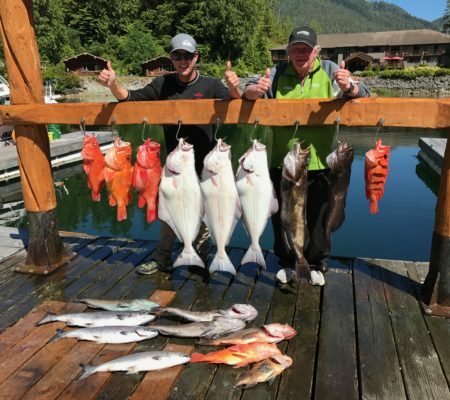 With fishing being so consistent around the South coast of Vancouver Island we’re confident it will be just a good in Barkley Sound to start the season. 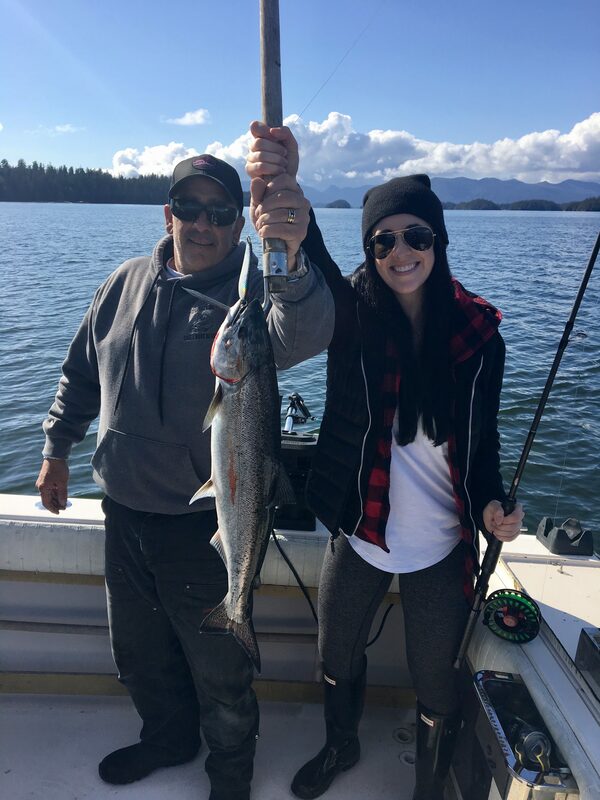 We have crews heading up both this weekend and next to continue getting the resort ready for our first pre-season derby June 2nd – 5th, so we’ll have a fishing report from the Sound next week. 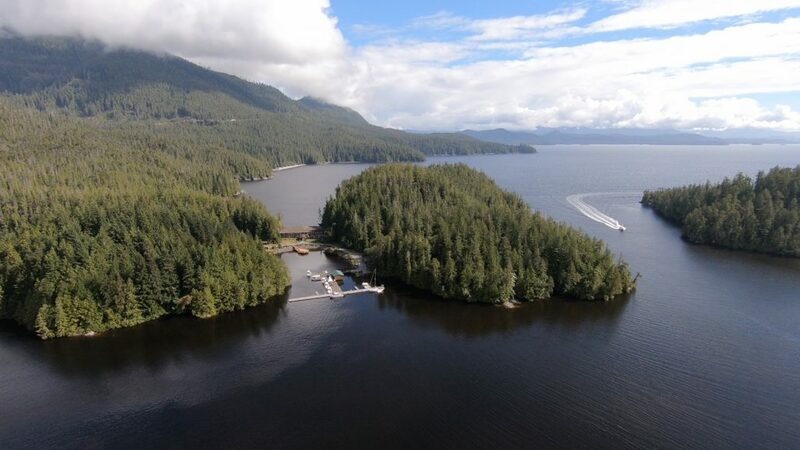 Both our derbies are completely sold out, but we’ve still got space for our Father’s Day Special for our regular season opening June 15th – 18th, so let us know soon if you and your dad want to spend an unforgettable weekend together fishing in Barkley Sound! The Easter long weekend meant another opportunity for some of our team to head back up to Eagle Nook and work on some small maintenance projects and this time our General Manager Dan made the trip with his family. Luckily the long weekend also brought some beautiful weather with it so the trip out to Barkley Sound certainly didn’t feel like a chore. One of our Grady Whites has been in Port Alberni for the winter having some work done and Dan had planned to pick it up on Friday on the way to Barkley Sound, however a misunderstanding meant the boat wasn’t in the water when he got there, and the shop was closed for Good Friday. Thankfully Kevin, our new maintenance man and water taxi captain, was able to cruise up the inlet and pick everyone up so they could still make it out to the west coast Friday afternoon, the only downside was not having a boat set up with downriggers to head out fishing – that would have to wait until Saturday. Saturday morning Dan got a surprise phone call from Matt, one of our guides who was spending the long weekend in Bamfield. When he heard that the Grady we’d planned to bring out to the resort for the weekend was still in Port Alberni he talked to a friend of his who happens to have a floatplane, and was able set up a last minute flight for Dan back into town to pick up the boat. It saved a ton of time over taking the water taxi all the way back up (not to mention gas) and Dan got a pretty neat flight up the inlet to top it off – not a bad way to start the day! 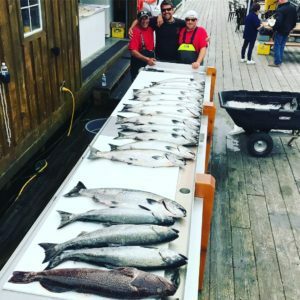 Once the Grady was out in Barkley Sound the crew were able to head out fishing; a jammed downrigger meant they lost a couple fish but once it was running smoothly they put 4 nice Chinook salmon in the box at Swale Rock. After fishing they went to check out the new cabin flooring Kevin has been working on – it looks great and will be ready to go with lots of time to spare before the season. 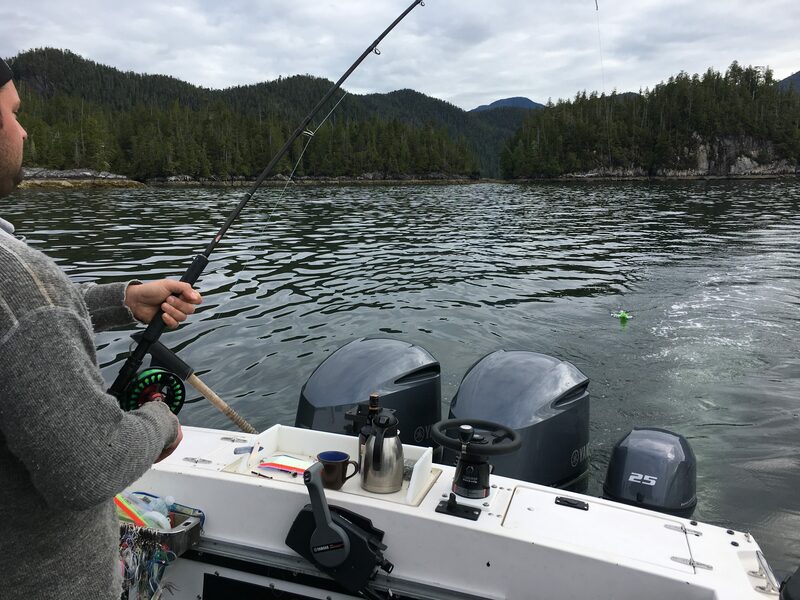 The remainder of the weekend was occupied with small maintenance tasks around the resort, and of course time out fishing in Barkley Sound. Fishing has been consistent so far on the inside, and dropping a line at Swale Rock is almost guaranteed to put a couple decent sized Chinook in the box. 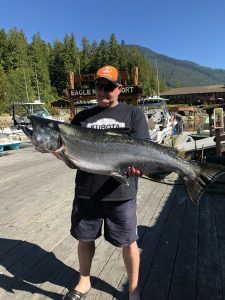 One of our other guides, Jeff, was out for a couple hours near Victoria on Thursday afternoon and landed 3 Chinook, the biggest being 18 pounds, so it looks like salmon are moving in all around Vancouver Island. There’s just over a month until the first group of us moves up to Eagle Nook for the summer – the full crew will be in by June 11th. The fishing season is booking up quickly but we’ve still got some room for our Father’s Day Special June 15th – 18th, or 18th – 22nd if you’re looking to do a longer trip. Let us know today if you want to join us to kick off our season!